I have a shameful admission to make. It is a fact that one of the first Indian dishes I cooked was using a Jamie Oliver recipe. Not that there is anything shameful about the loveable Mr. Oliver (who I have for years had a small crush on). But I was brought up by parents who could both cook and my mother despaired that at that stage, I still hadn’t stayed still long enough in the kitchen for her to teach me how to cook a good South Indian meal. She wasn’t sure whether to be offended or relieved that it was that energetic Englishman with an adorable lisp who had finally gotten me to play with ‘our’ spices. 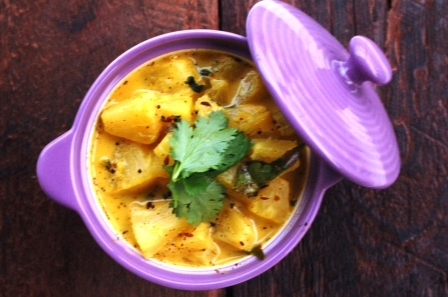 And that I hadn’t chosen to make a rasam or a sambhar, but a pineapple curry of all things. I have always thought of pineapples as the echidna (or hedgehog) of the fruit world. Tough, leathery skin covered in thorns and that spiky tuft of leaves on top all scream TOUCH ME AND DIE (or at least, touch me and get the equivalent of a paper cut). Yes, when it comes to self-defence, this tropical treat has the right idea. The plant however, is another story. 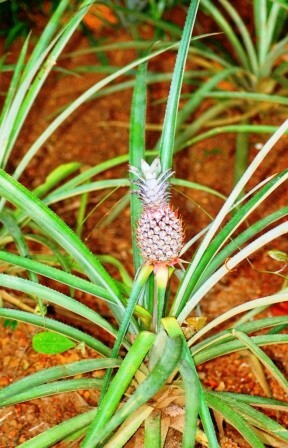 I first saw the pineapple plant on a holiday in Kerala and I remember thinking that it looked like someone had just placed a pineapple on a stick and surrounded it by leaves. One look at that plant and it is hard to take that bristly Mr. Pineapple seriously. So let’s get that scary pineapple into this coconutty sauce. Actually I used tinned pineapple but I’m sure this curry will be equally delish using fresh pineapple, provided you have the patience and elbow grease to get past its defences. Either way, the hot-sweet-sourness on a bed of rice makes this a wonderful comfort food in any season. This makes a fairly spicy curry, so if you are not big on spicy food, use half the amount or just a pinch of chilli powder. In a small pan, dry roast cardamom, 1/2 tsp cumin seeds and 1/2 tsp coriander seeds until fragrant. 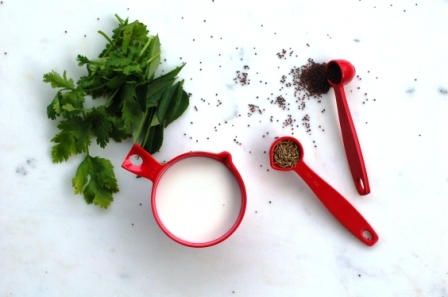 Grind to a powder using a food processor or mortar and pestle. In a saucepan or wok, heat oil and temper 1 tsp cumin seeds and 1/2 tsp mustard seeds. Add ground spices, turmeric and chilli powder and stir for 1-2 mins on a medium heat. Add curry leaves and ginger, stir until leaves are fried. 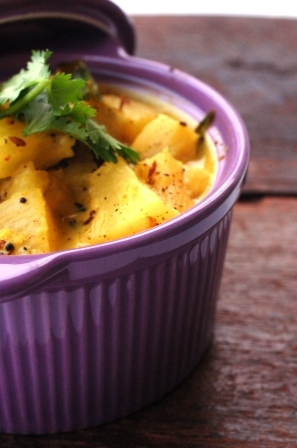 Add pineapple and stir to coat pineapple in spices. Add coconut milk and about a tsp of salt. Taste and add more salt if required. Cover and simmer on a low to medium heat for 5 mins. Sprinkle chopped coriander and stir through. Serve atop steamed or boiled rice. Oh my goodness. Personally, I LOVE pineapple – especially warm and cozy pineapple. I think I need to try this!